.When going over a historical account there is always just a little overlooked fact that will be the dead give-away tell-tale fact that will suggest that behind what is being served up as a historical “truth” is a much more interesting story. CREDIT: Painting by Cobus van Bosch who has done a wonderful series of works memorializing the Orlam Leaders by using historical photographs in the public domain and giving it added value for future generations. His historical works are a great resource for educating our youth and instilling pride after years of oppression. This art is a wonderful practical act of reparation and restitution. Its deep value goes way beyond the confines of the gallery to live in the gallery of the hearts and minds of the descendants of these valiant men and women who once were warriors. Thank you Cobus. So is the case of an organisation established in 1875 by Boer intellectuals in Paarl called “Die Genootskap van Regte Afrikaners” (GRA -The Association of Real Afrikaners…. or True Afrikaners). Their starting point was that they recognised that what was referred to as Cape Low Dutch had emerged as the lingua franca of most Boers who could no longer speak pure Dutch and they christened their observation of this language variant – Afrikaans. Shortly after, they launched their newspaper “The Patriot” which made it clear that their mission was not just a language claim but that they were also founded on a claim to a “God-given land”. The Association and their newspaper was deeply rooted in three things – language, land and people (language, country and nation) and thus became the early standard bearer of Afrikaner Nationalism. In 1881 a Boer protest movement known as the Zuid Afrikaansche Boeren Beschermings Vereeniging (South African Farmers’ Protection Association) of Jan Hendrik Hofmeyr emerged as a proto political party and joined with the GRA and formed a political party called the Afrikaner Bond which took its place in the Cape Parliament. So why in seeking a more inclusive and respectful term as an aspirant and emergent national group did they not just call themselves “The Association of Afrikaners”. The answer lies in the tell-tale use of the term “regte” meaning “real” or “true”. In asking why they needed to do this, the obvious answer is that there must have already been people that called themselves “Afrikaners” and a language ‘Afrikaans’ that the new association wanted to both distinguish themselves from and lay claim to the term and language for themselves. It is this political usurping of the term “Afrikaner” or “African” and the language of “Afrikaans” that is the more interesting story than what became the dominant narrative. There were immediately opponents of the announcement of this “new language” and use of the term “Afrikaander” later modified to “Afrikaner” and it came from within the Boer constituency from those who wanted to maintain High Dutch as their language despite the fact that youth were more and more taken by English or spoke the Cape Low Dutch. The reason that they gave for their opposition spells out why they were so opposed. They said that the adoption of this “Afrikaans patois” was nothing but an adoption of the “Hotnotstaaltjie”. Afrikaans was regarded as the language of those regarded as Khoena and ‘Coloured’….. the people derogatorily called “Hotnot-Basters” were those who called themselves Afrikaners and everyone knew it. A popular story was partially related by the Afrikaans language movement to try to track the genesis of the term Afrikander to European settlers by referring to an utterance by a 16 year old boy, Henrik Biebouw. Detlef Biebouw was a German labourer (knegt) who had a child with a slave, Diana van Madagascar, belonging to Cornelis Linnes. Detlef then later bought Diana when their daughter Susanna was around 6 years old but he married an orphan girl Wilhelmina de Wit shipped from Rotterdam and they lived on the fringe with the mixed Khoena, slave and knegt lower class of Stellenbosch. In 1694 Wilhelmina bore Detlef a son, Hendrik who grew up in this mixed community shunned by the settler mainstream. In 1710 the 16 year old Hendrik was brought to court after a drunk and rowdy disturbance of the peace the night before. Hendrik basically told the magistrate where to get off by implying that as a foreigner the magistrate had no right to be telling him how to behave in public – “because I am an African (Afrikaander)”, in reference to the locally born in his mixed community. The term was quite clear at that time and no respected European settlers would allow themselves to be referred to us such. The fact of the matter is also that by the time Hendrik was 20 he got on a ship and left the Cape for good. Before 1710 the term was already well used by people of colour at the Cape as can here be illustrated. 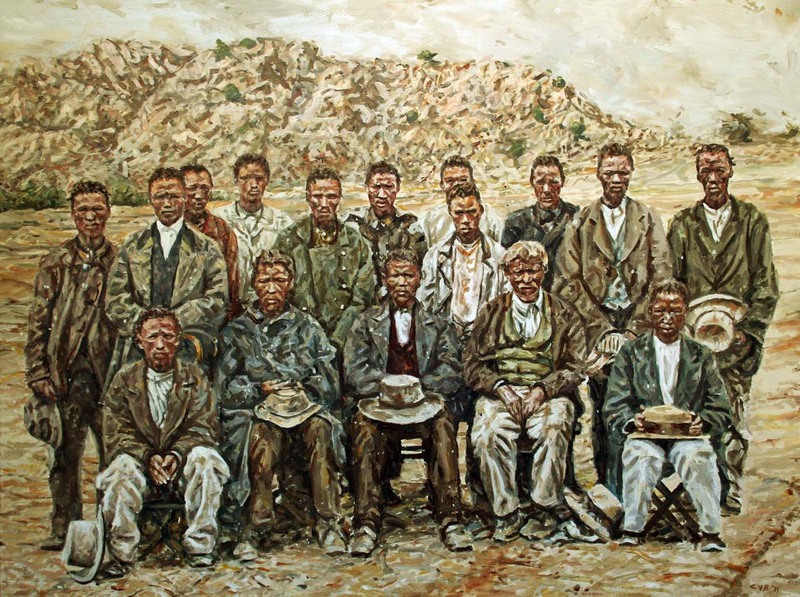 There were already a proto national group called the Orlam Afrikaners who were descendants of Khoena and Slaves who had trekked up from the Roodezand (Tulbagh) to the Gariep region and had left an indelible mark on the Southern African landscape. This Afrikaner dynasty had been using this term “Afrikaner” as their surname going back to their progenitor Oude Ram Afrikaner since the late 1600s. From a surname the term broadened to mean all of the followers of Jager Afrikaner – the fighter in the Gariep district. His cousin Jonker Afrikaner was the man who founded the city of Windhoek. Jager’s brother Afrikaner Afrikaner died in incarceration on Robben Island. Some of my own forbears in the Roodezand (Tulbagh) were from this community of “Afrikaners of colour”. One of my 6th great grandmothers (paternal) had the inscription in her baptismal record – Kaatje Hottentotin. Her name was Johanna Catharina Voortman van de Caab. She had a long marriage with Heinrich Voortman, a German, and two of their daughters married two sons of French Hugenot settlers, the le Cordiers. Both sisters make up different lines in my family tree up to my paternal grandmother Elsie Petronella le Cordier who married my grandfather Pieter Francois Mellet in District Six in the 1920s where my father and his siblings were born. Many of today’s le Cordiers, le Codeurs and Kortjes all descend from these three mixed relationships at the Roodezand. The term “Afrikaner” goes back to the early use of toponyms to denote where slaves were taken from…. Eg: Anthonie van Angola, Angela van Bengal etc. First generation slaves born in the Cape Colony were referred to as Eg…. Catherina van de Caab (Kaap). Persons born out of unions of slaves and indigene Khoena were given the toponym Eg…. Klaas van Afrika which then simply became Klaas Afrika or Klaas Afrikaander. It was thus that the old progenitor of the Afrikaner clan, born circa 1690, became known as Oude Ram Afrikaner whose son was Klaas Afrikaner. Around that time it became common to also refer to people born of mixed Khoena, slave and European relationships as Afrikaanders also known as Free Blacks. But it was considered a term for the low class labourers of colour. Thus in the Cape as had occurred elsewhere in the colonial world the term “African” was used in the context of slavery. It had never been used within Africa as a term of identity except in North Africa in the town of Afariqa by the Afars. If one thinks through this it makes common sense. Why would anyone in Africa even know the term or think of a continental land mass until people were forcibly taken away and could look back to from where they had been taken into slavery. Each slave had their own locality from which they had been taken to coastal towns and then loaded onto ships and taken to new places. Collectively they began to refer to themselves by the continental name used by their captors – Africans. In the Cape which was the only place on Africa to which the Europeans had brought slaves, the terms van de Caab and van Afrika took its own unique twist. Afrikaner was a term denoting class, colour and mixing. Afrikaans too, as a written language, predates the translation of the Bible into Afrikaans by a century and the publishing efforts of the Association of True Afrikaners by at least a half century. Texts from the Koran and Madrassa lessons written in phonetic Afrikaans using Arabic script exist to prove this assertion that the earliest written Afrikaans emerged from among the slaves at the Cape. The first usage of the term Africa and African in South Africa as self-identifying terms for people and language is rooted amongst the Khoena, San and the slaves. Thus the term “Regte” meaning “True or Real” was an unfortunate subterfuge when adopted by the Association of True Afrikaners. Perhaps one day the children of the “Afrikaners of Colour” and the children of those who saw themselves as “Regte Afrikaners” may reconcile and “AfriKaaps” and “Regte Afrikaans” may reconcile too. Perhaps this approach to our history and the tense ties that bind us may hold the key for the resolution of the vexing issues of the future of both the Afrikaans language and those who still see themselves as “Regte Afrikaners”. It is wonderful to see that many young white Afrikaans speakers are exploring those aspects of history that have as Elna Boesak once put it ….fallen “tussen die kraake” and in so doing, finding liberation and connectedness with Africa and the Africans their forebears once rejected. Hm. Maybe, maybe not. I always thought ‘regte Afrikaners’ were meant to distinguish these Afrikaans promoters from Afrikaners with an ‘English heart’ and those with a ‘Dutch heart’. Is there any evidence to support this interesting interpretation? Erwin yours is a rather novel approach which flies in the face of much historical research. The Afrikaans Taal Monument now formally accepts the outlook that I express and has added to its exhibition this expression by persons of colour rectifying the story of Afrikaans. Today in SA it is acknowledged that more people of colour than white people speak the language and that there are more codexes of the language than that established first by the GVRA. Indeed, Rode, in 1875 I find it hard to imagine the white populations of the Cape considering the non-white population as much of a priority. The franchise was held by males of all ethnic groups, as long as they had property of more than £25. The dominant issues of the day, as you indicate, would have been the dynamic between the major groups among these voters, in their great majority, white, especially with relation to the British power. Indeed, just a few years later, we have a full-on war between two WHITE groups. This story of the naming of the think-tank organisation does not gel with the overall context and priorities. The pre-eminence of white culture in the development of Afrikaans should also be self-evident by the fact that the language in question is of European origin! So whose land is it anyway? The Afrikaanders obviously. To avoid any confusion, because of the labelling of our people by uitlanders as khoi/San, coloureds, etc., we prefer to call our people the Foundation Nation. It is only the truth that will set people free, and it is by time that ‘white Afrikaners’ and the government embrace this reality. In the process of true reconciliation, the land should be returned to the original inhabitants. Until the restoration of the Foundation Nation is complete, South Africa will not know what true freedom is. Dis ‘n geweldige fasineerde verhaal. Ek is beindruk met die objektiewe manier van die geskiedenis herskrywe hier- die enigste letsel wat ek raaksien in die geskiedenis oordenking is die feit dat dit in Engels vertel word- die vloei, die van die tong rol van die Afrikaanse taal gaan daardeur verlore, saam met die hartsgevoel van die skrywer vir die taal waaroor hy skryf. Goed gedaan. Pragtig! tien uit tien vir jou. Moeniemskaam wees nie. Praat die taal en wees verseker daar is baie wat ongelooflik life is vir die taal en kultuur van die Afrikaner. Ons is soos jy dit noem , almal van oor die wereld in hierdie potjie gegooi met ‘n doel van ons Skeeper om Sy lig in Afrika te laat skyn. weer, baie objektief vertel- dus niks wat dui daarop dat u nie dit waardig is nie. met vingerwysery en met klappe na dit wat was gaan mens nerens heen nie. Hierdie blog kan fantastiese brûe bou, maar kan ook as dit nie reg bestuur word die verlede die toekoms laat word. Ek vra in alle nederigheid dat negatiewe uitlatings oor mense wat geen beheer het vanwaar hulle kom ter syde gestel word. Indien u wil bou, bou dan en moet nie afbreek nie. The painting you’ve used is by Cobus van Bosch. It would be a good idea to credit it as such, assuming you had his permission to use it. It has been done. The lack of accreditation by this non-profit public education blogsite was an oversight rather than an ethical misdemeanor. I have been in communication with a fellow artist friend of Cobus who contacted me about the accreditation. I have both an admiration for Cobus work and a respect for him. The issue of acknowledging Cobus is less about ethics than about how I have corrected the ommission. The original photographs emerged from a scenario of photography where all ethics went out of the window, much in the same manner that ethics went out of the window for all the beneficiaries of colonialism and Apartheid. Cobus has done something great with these photographs in painting them for prosterity, memorial use, educational use and to pay tribute way beyond the confines of who owns the paintings or galleries. In many ways it is restoration, restitution and reparation. This is the context of the use of this picture on this website and it was in recognition of this that it was used rather than the original photo in the public domain. You see if one wants to talk about ethics you need to ask what role does the descendants have in the use of their forebears images. That is an ethical debate. What occurred here is a genuine oversight in bringing recognition to the fore for something very great that Cobus has done and deserves recognition for….. much in the same way of the Mark Solms story. I dont know Cobus but as an artist I think he has done a little bit of what Mark has done, and I have met Mark. Mark Solms took his farm, for which he has title deed and all legal entitlement, Solms Delta, and recognising that ethically he has no right to that farm in toto regardless of the legalities, and he voluntarily signed away half of the farm to those who are the descendants who worked that farm for a few centuries and still work it. He also set up a trust for the education of the farmworkers children, and established a Museum on the property to tell the story of the farmworkers forbears and gave it to them to run, and he organises together with a trust on which farmworkers representatives sit. This is what is what is ETHICAL rather than self-righteous accusations of non-ETHICAL intent that a totally non-rewarding educational service focused on restitution of memory and reparation for the THEFT of land, life and heritage by a minority who has benefited handsomely and are yet to make the efforts of the few Mark’s and Cobus’s of this world. Others have raised the issue in a respectful manner and I quickly responded appropriately with a mea culpa and the special tribute that Cobus deserved. There is great anguish in our community labelled “Coloured” about our suppressed history and heritage. Perhaps you may spare a thought about what such images mean to us after years of having not only our forebears images appropriated but also the land, our liberty and souls. I thank you Madam. VEry nice propaganda. Now start citing your sources. All the impeccable sources will be accompanying the full article when published soon by a leading academic publication. Accusations of propaganda coming from the Neo-Fascist propagandists of yesteryear who presented the pictures of Mr Vermuyden and Ms Kettering on banknotes, stamps and textbooks……claiming these to be Jan van Riebeeck and Maria de la Quellerie and made you guys the laughing stock of the world is a bit rich. I would not be barking too much if I were in your boots mate. Good ethics to give recognition to artist, Cobus van Bosch, for his painting you are using as your illustration! An important oversight on my part which has been corrected after interacting with a friend of Cobus. Perhaps you could give credit to the artist who painted the portrait. An important oversite on my part…. mea culpa. Have done so now. Thanks. Caucasian resistance almost hysterical ! Truth hurts, hey ! and pass that to your children as heritage. It is time to repent and ask forgiveness for your too many sins…. I believe the mixed race people that came out of the Cape and its many bloodline machinations have an absolute right to be known as Afrikaners. I have German, Hugenot and Scots genes, home language is English, fluent in Afrikaans and Zulu too. 12th generation South African…. I consider myself an Afrikaner. If I am not, then what am I…. I am certainly not European besides the fact that I have blonde hair and blue eyes. Well…. the hair is silver these days. I had a meeting with some ladies in Ghana yesterday for a charity function I am assisting them with one a Pretoria lady, Afrikaans, one from Kuils River… Afrikaans and one from Mitchells plain… Afrikaans. We sat and ahd coffee afterwards and had a wonderful talk for a couple of hours…. I was at home… and so were they, besides the fact that two were mixed race…. Yes, we are Afrikaners.